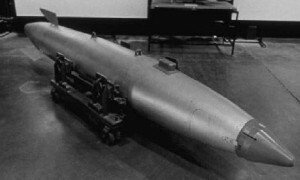 Ten other Canberras in the squadron could in theory be loaded with an H-bomb within half an hour. During the Cuban crisis in October, 1962, the regimental sergeant mustered the men. Kevin’s real fear concerned the pairs of American guards, called “Custodians”, who guarded the H-bomb on each Canberra. The Custodians rotated in four-hour shifts. There was a painted white line at the entry to the bombers’ huts. This marked the “No Lone Zone” boundary, meaning no person could cross alone. If one did, the Custodians would use their sub-machine guns. Pairs of base workers could cross, but the guards would follow one pace behind. The brothers agreed, “Those guys were crazy!” Bored and getting through piles of Playboys, the guards played a little game while doing escorts. They wore a loaded pistol on each hip, à la General Patton, in specially cut-down holsters. They practised quick-draws on their escortees, making Kevin sweat. “At Bruggen base near us, we heard they killed one of their own guys,” he says. The base’s three squadron commanders each happened to have female-sounding names—Carroll, Adrian and Gene. “At monthly parades, with drawn swords, they’d greet each other in cut-glass accents with, ‘Hello Carroll!’ ‘Good morning, Gene!’ and we’d snicker. They never understood why. “We hated Carroll, he was so vain. He had a little dog called Dudley. Dudley had a hard time because any chance we got, we’d give him a kick up the arse. “One time Albert, one of our dog handlers, stopped Carroll for ID when he was walking down the tarmac smoking a pipe. ‘God, man! Don’t you know me? All those planes are mine!’ Carroll said. “Carroll went to get in the front seat but the German shepherd was already there and went ‘Grr!’ at him, and made him leap into the back seat. Albert drove him to the flying officers’ blockhouse, which was a shambles—they were all fed up and boozing. They leapt up as if they were spring-loaded. Blaise’s wife, Shirley, was also on the base, working as assistant to the commander and with a higher security clearance than Blaise. She knew when there would be a practice alert; he didn’t. He might propose a romantic dinner out followed by the movies and she would go along with it, although aware of an alert scheduled for 8.30 p.m. However, Blaise says the Germans on the base somehow always got wind of the alerts and would tip him off. The Canberra’s huts were next to an entry guardhouse, a blockhouse for crew living quarters, and a surrounding pair of fences, with guard dogs trained to lope around between the fences. The inner fence was electrified. The area was floodlit all night. Ground crews lived on-call in the blockhouse for seven days straight, waiting for an alert. “We played cards and did silly things. Our sport was indoor croquet,” Kevin says. The real thing would be a suicide mission for the pilots, because the H-blast would take the Canberra down with it. Kevin says, “They were supposed to use LABS—low altitude bombing system—flying in really low, and spiralling upwards at the target. A ram would push the bomb out sideways and they’d roll over and try to race away from the shock wave. “For practice, our other ten Canberras (right) would suddenly come down the strip and get ready to be loaded up with H-bombs from the armoury. Each bomb weighed about a tonne. One morning a Javelin ran off the runway on landing, skidded through the crash barriers and up-ended itself on the Dutch side of the border—while carrying a full load of live missiles. The two crew escaped with bruises and Dutch civilians took them to a pub. They were having their first drink to settle their shaky nerves when two Dutch customs officials arrived (this was before the Common Market) and demanded, “Have you any goods to declare?” Blaise says they might at least have asked if the airmen needed a doctor. Blaise: “Brits’ conditions were really poor. If you got sent home injured, there’d be raffles and charity drives to look after you. The idea was that you’d been privileged to serve Queen and country.” Of course, he adds, the Brits in turn were far better off than the Soviet forces across the border in East Germany freezing in their trenches, ice and slush. After ten years with the RAF, Kevin moved to Perth, where he eventually ran his own successful business, KD Instruments, before retiring in 2001. 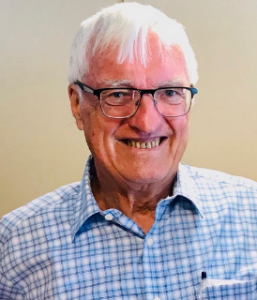 Blaise came to Australia in 1967 and served twenty-one years with the RAAF Reserve. Blaise went back for a Battle of Britain anniversary four years ago, and at the Duxford air museum, when they found he’d been a flight sergeant, they took him into a volunteers’ lounge room exclusive to former sergeants and warrant officers. “In Australia they never kept up such distinctions,” he says. The British left Geilenkirchen in 1968 and the Germans converted it for Pershing theatre nuclear missiles, again with the US controlling the warheads. Today the base runs early-warning (AWACS) aircraft. The Cold War is long over, but the US still has about 500 nuclear bombs in Western Europe.